3-channel V-Net EGT junction box and EGT sensors. Programmed as Cyls 1-2-3 with 9" T-cable. 3-channel V-Net EGT junction box and EGT sensors. Programmed as Cyls 1-2-3 with 18" T-cable. 3-channel V-Net EGT junction box and EGT sensors. Programmed as Cyls 1-2-3 with 36" T-cable. 3-channel V-Net EGT junction box and EGT sensors. Programmed as Cyls 1-3-5 with 9" T-cable. 3-channel V-Net EGT junction box and EGT sensors. Programmed as Cyls 1-3-5 with 18" T-cable. 3-channel V-Net EGT junction box and EGT sensors. Programmed as Cyls 1-3-5 with 36" T-cable. 3-channel V-Net EGT junction box and EGT sensors. Programmed as Cyls 2-4-6 with 9" T-cable. 3-channel V-Net EGT junction box and EGT sensors. Programmed as Cyls 2-4-6 with 18" T-cable. 3-channel V-Net EGT junction box and EGT sensors. Programmed as Cyls 2-4-6 with 36" T-cable. 3-channel V-Net EGT junction box and EGT sensors. Programmed as Cyls 4-5-6 with 9" T-cable. 3-channel V-Net EGT junction box and EGT sensors. Programmed as Cyls 4-5-6 with 18" T-cable. 3-channel V-Net EGT junction box and EGT sensors. Programmed as Cyls 4-5-6 with 36" T-cable. 3-channel V-Net EGT junction box and Turbo EGT sensors. Programmed as Cyls 1-2-3 with 9" T-cable. 3-channel V-Net EGT junction box and Turbo EGT sensors. Programmed as Cyls 1-2-3 with 18" T-cable. 3-channel V-Net EGT junction box and Turbo EGT sensors. Programmed as Cyls 1-2-3 with 36" T-cable. 3-channel V-Net EGT junction box and Turbo EGT sensors. Programmed as Cyls 4-5-6 with 9" T-cable. 3-channel V-Net EGT junction box and Turbo EGT sensors. Programmed as Cyls 4-5-6 with 18" T-cable. 3-channel V-Net EGT junction box and Turbo EGT sensors. Programmed as Cyls 4-5-6 with 36" T-cable. 4-channel V-Net EGT junction box and EGT sensors. Programmed as Cyls 1-2-3-4 with 9" T-cable. 4-channel V-Net EGT junction box and EGT sensors. Programmed as Cyls 1-2-3-4 with 18" T-cable. 4-channel V-Net EGT junction box and EGT sensors. Programmed as Cyls 1-2-3-4 with 36" T-cable. 4-channel V-Net EGT junction box and EGT sensors. Programmed as Cyls 5-6-7-8 with 9" T-cable. 4-channel V-Net EGT junction box and EGT sensors. Programmed as Cyls 5-6-7-8 with 18" T-cable. 4-channel V-Net EGT junction box and EGT sensors. Programmed as Cyls 5-6-7-8 with 36" T-cable. 4-channel V-Net EGT junction box and Turbo EGT sensors. Programmed as Cyls 1-2-3-4 with 9" T-cable. 4-channel V-Net EGT junction box and Turbo EGT sensors. Programmed as Cyls 1-2-3-4 with 18" T-cable. 4-channel V-Net EGT junction box and Turbo EGT sensors. Programmed as Cyls 1-2-3-4 with 36" T-cable. 4-channel V-Net EGT junction box and EGT sensors with BBC spacing. Programmed as Cyls 1-3-5-7 with 9" T-cable. 4-channel V-Net EGT junction box and EGT sensors with BBC spacing. Programmed as Cyls 1-3-5-7 with 18" T-cable. 4-channel V-Net EGT junction box and EGT sensors with BBC spacing. Programmed as Cyls 1-3-5-7 with 36" T-cable. 4-channel V-Net EGT junction box and EGT sensors with SBC spacing. Programmed as Cyls 1-3-5-7 with 9" T-cable. 4-channel V-Net EGT junction box and EGT sensors with SBC spacing. Programmed as Cyls 1-3-5-7 with 18" T-cable. 4-channel V-Net EGT junction box and EGT sensors with SBC spacing. Programmed as Cyls 1-3-5-7 with 36" T-cable. 4-channel V-Net EGT junction box and Turbo EGT sensors. Programmed as Cyls 1-3-5-7 with 9" T-cable. 4-channel V-Net EGT junction box and Turbo EGT sensors. Programmed as Cyls 1-3-5-7 with 18" T-cable. 4-channel V-Net EGT junction box and Turbo EGT sensors. Programmed as Cyls 1-3-5-7 with 36" T-cable. 4-channel V-Net EGT junction box and EGT sensors with BBC spacing. Programmed as Cyls 2-4-6-8 with 9" T-cable. 4-channel V-Net EGT junction box and EGT sensors with BBC spacing. Programmed as Cyls 2-4-6-8 with 18" T-cable. 4-channel V-Net EGT junction box and EGT sensors with BBC spacing. Programmed as Cyls 2-4-6-8 with 36" T-cable. 4-channel V-Net EGT junction box and EGT sensors with SBC spacing. Programmed as Cyls 2-4-6-8 with 9" T-cable. 4-channel V-Net EGT junction box and EGT sensors with SBC spacing. Programmed as Cyls 2-4-6-8 with 18" T-cable. 4-channel V-Net EGT junction box and EGT sensors with SBC spacing. Programmed as Cyls 2-4-6-8 with 36" T-cable. 4-channel V-Net EGT junction box and Turbo EGT sensors. Programmed as Cyls 2-4-6-8 with 9" T-cable. 4-channel V-Net EGT junction box and Turbo EGT sensors. Programmed as Cyls 2-4-6-8 with 18" T-cable. 4-channel V-Net EGT junction box and Turbo EGT sensors. Programmed as Cyls 2-4-6-8 with 36" T-cable. 4-channel V-Net EGT junction box and Turbo EGT sensors. Programmed as Cyls 5-6-7-8 with 9" T-cable. 4-channel V-Net EGT junction box and Turbo EGT sensors. Programmed as Cyls 5-6-7-8 with 18" T-cable. 4-channel V-Net EGT junction box and Turbo EGT sensors. Programmed as Cyls 5-6-7-8 with 36" T-cable. 1.812" 8-magnet aluminum split collar. 1.875" 8-magnet aluminum split collar. 2.125" 8-magnet aluminum split collar. 2.187" 8-magnet aluminum split collar. 4" Door car front shock travel sensor kit. 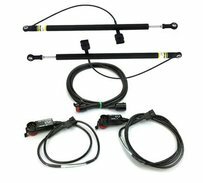 8" Door car rear shock travel sensor kit. The V-Net 2-Axis G-Meter adds lateral and acceleration g-force readings to any Racepak V-Net display or logger dash. This module is used to monitor a 12 volt power source. 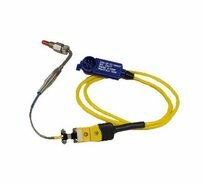 Ideal for monitoring an isolated electrical source. 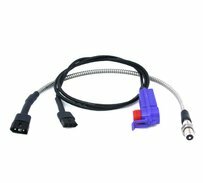 This module allows you to connect an additional Engine RPM input to your V-series data logger or dash. Infrared sensors are used to monitor temperatures such as track or tire temperature. 0-15 PSI V-Net Nitrous Fuel pressure #1 module and sensor. 0-15 PSI V-Net Nitrous Fuel pressure #2 module and sensor. 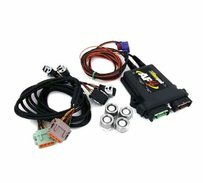 0-15 PSI V-Net Nitrous Fuel pressure #3 module and sensor. 0-15 PSI V-Net Nitrous Fuel pressure #4 module and sensor. 0-300°F V-Net Oil temperature module and sensor. Comes with a 72" lead. Sensor is 1/8" NPT. 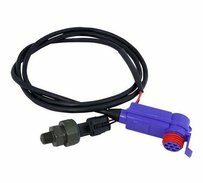 0-500 PSI V-Net Transmission pressure module and sensor. Second generation Pro Analog Transducer Box . Plug-in style transducers and adapter modules must be purchased separately.